A used Volvo C30 is an excellent hatchback based on its own merits. Introduced in 2006 with an initial choice of four different trim levels, the Volvo C30 was updated in 2007 with some stylish R-DESIGN variants that bolstered its street cred. Both diesel and petrol engines were on offer, while in 2010 the range benefitted from an extensive aesthetic update for both standard models and the R-Design iterations. The C30 remains a popular choice on both the new and second-hand market. If you're interested in snapping up a used example, you’ll have a decent amount of choice. The Volvo C30 isn't short on interior space, with four adults able to clamber in and sit comfortably for as long as is necessary. The seating is relatively flexible, with the back row folding flat to help expand the boot capacity for when you need to haul a major load. Volvo has done a top job of making the C30's interior feel elegant and modern, with lots of little touches coming together to make it feel luxurious without being exorbitantly expensive. On the outside you get a sweeping, swooping body combined with a back end that's full of character. The standard 1.6-litre petrol power plant delivers about 100bhp, which means that the C30 starts off as a modest performer for those more interested in cruising comfort and exterior appearances than speed. However, if you pick one of the T5 editions, you get much more grunt, with almost 230bhp available from the more recent iterations. This makes it a seriously hot hatch! The approved used Volvo C30 can be found with an auto gearbox onboard, but the six-speed manual is more responsive and fun, particularly if performance is on your list of priorities. There are a number of fuel-efficient versions of the C30 available too, including the bioethanol-compatible FlexiFuel edition. More common are the DRIVe diesel iterations, which will help you avoid such regular visits to the petrol pump. 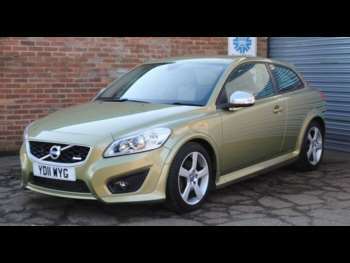 Got a specific Volvo C30 model in mind?